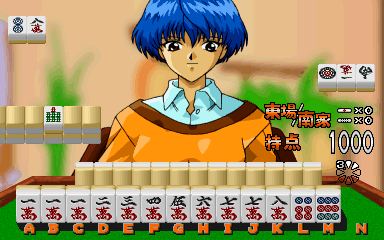 Wakakusa Monogatari Mahjong Yonshimai © 1996 Maboroshi Ware. Anime-style mahjong game with lovely female opponents and bonus games. Released in April 1996 in Japan. The title of this game translates from Japanese as 'Young Grass Mahjong Story - Four Sisters'. 'Wakakusa Monogatari' is also the Japanese title of the Louisa May Alcott novel 'Little Women', which this mahjong game is *very* loosely based on.